One of seven Ionian islands, Kefalonia lies 30 miles away from mainland Greece. It has many different spellings (Cephallenia, Cephallonia, Kefallinia, Kefallonia) due to the diverse ruling entities that historically conquered the island. The natural splendor of the island is breathtaking; Kefalonia has not been overwhelmed by tourism and remains unspoiled, idyllic, and beautiful. Houses set into the hillsides and quaint fishing towns characterize this rustic island. Argostoli, on the east side of the island, is the capital. Even though it’s a small town, Argostoli is more cosmopolitan than you would expect. It has plenty of restaurants and bars, and the pedestrian area of Lithostroto Street runs past many different shops. If you’re looking for some history, visit the Archeological Museum, where excavated artifacts have been collected to tell the story of the island’s past, or step into the impressive library that houses over 50,000 ancient manuscripts and books. Sami is a tiny village that was constructed near the ruins of one of Kefalonia’s prominent ancient cities. Although the town is small, it has a significant port, and the surrounding landscape is stunning. In the summer months, the village swarms with tourists attending a variety of cultural events and festivals. Sami is also home to several monasteries, intriguing caves, and popular Mellisani Lake. To the north, Fiscardo village is one of the few that was not demolished by the earthquake of 1953. Many historical buildings have been preserved, so visiting Fiscardo is like visiting an era from the past. On a warm summer evening, you can stroll amidst the million-dollar yachts and open-air cafes. Fiscardo is a unique blend of old and new, magic and charm. Sami’s Melissani Lake is an underground grotto surrounded not only by trees and forests, but also by cave walls. At midday, the sun reflects off the water, bathing the cave walls in an aqua hue. A boat tour of the lake will take you through the sunlit chamber to a quiet, darker room with stalactites shaped like dolphins and a massive, dome-shaped ceiling. 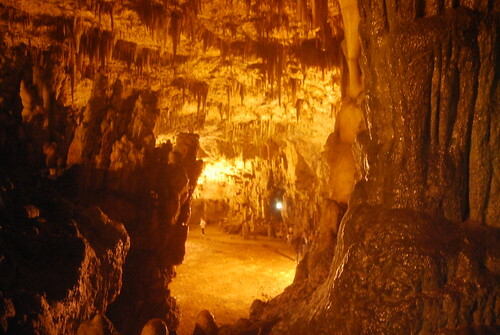 You can also view the cave from above by standing on a man-made balcony at the top. The Drogarati Cave was only opened to the public in the 1960s, but the cave is more than 100 million years old. The stalactites dangling from the cave ceiling form complex shapes and reflect the light coming into the cave. One of the chambers in the cave has great acoustics and has been used as an auditorium for concerts and cultural events! The villages of Kefalonia are not far from the island’s unspoiled beaches. The island’s undulating coastline has created several secluded bays, where the Mediterranean water is calm and the beach areas capture the sun’s mild rays. 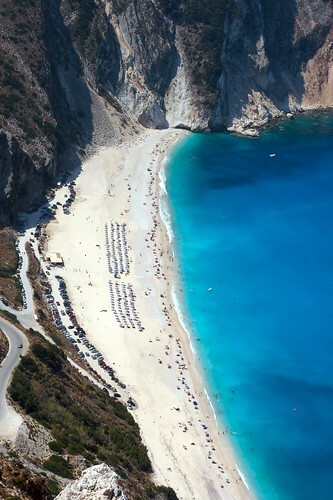 Perhaps the most well known beach in Kefalonia is Myrtos. This beach has been described as “the most beautiful beach in the world,” and is made of smooth white pebbles, and crystal clear waves “so blue it hurts your eyes.” The high cliffs that surround the half-moon bay are even more dramatic when they reflect the vivid colors of a sunset. 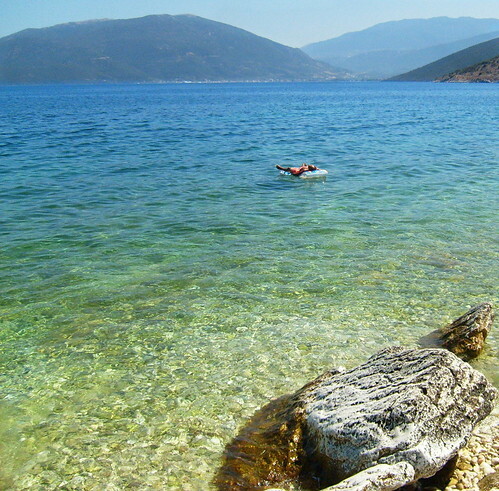 Antisamos has attracted sunbathers as well as movie buffs; some scenes from the movie ‘Captain Corelli’s Mandolin’ were filmed there. The wide beach fades into the lush greenery of the surrounding hills, and the road from Sami to Antisamos takes you past many isolated coves where you can bathe in the Mediterranean or take snapshots of the views. Whether your visit is for business, a vacation or a honeymoon, Kefalonia will provide you with a variety of entertainment and will capture your heart. It’s a quiet island, but it has enough vivacity and charm to resonate for a lifetime. Francesca Santelli is an avid European traveler who also occasionally writes for Hotels-Fairy.com. When she is not in the UK she is holidaying around the Gran Canaria or the Greek islands. What a life!! !